It is very true that it doesn’t matter what equipment you use — it’s what you do with the camera that matters. However, there is no question that when you’re hiking through a thick jungle in the middle of central america you want to pack light. Even though the Nikon D2x has the prestige of being Nikon’s premier “PRO” camera, you may not find it’s the best fit for your nature work. One of the first things you need to consider is how you’re going to use the pictures. Look up the magazines you want to publish your work. Send in for “submission guidelines” and find out their minimum mega pixel count. The same is true for stock agencies — browse around and decide which place you’d ultimately like to sell your work. Many organizations have their submission guideliens published on their websites. If you’re more interested in learning and doing nature photography for your own pleasure then by all means buy the less expensive models. There’s nothing wrong with a camera that takes a 5 or 6 megapixel image. You’ll still be able to blow it up to poster size if you want a special print made. 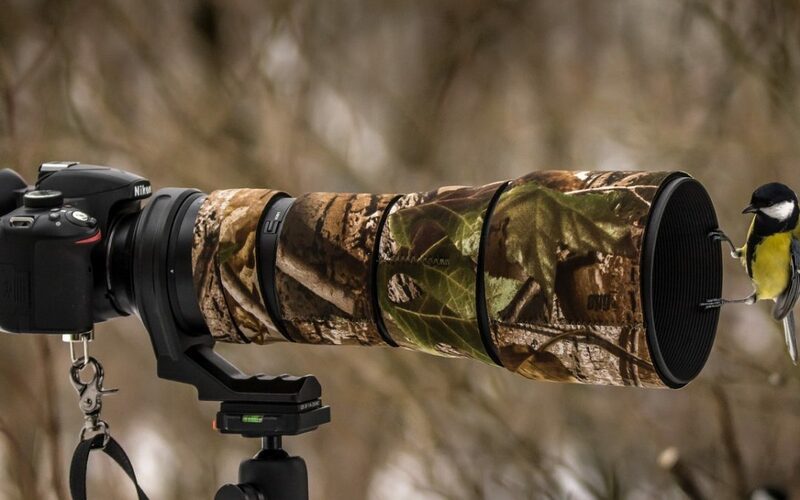 Unfortunately, no one can tell you which lenses to buy or “how to build the perfect SLR system for nature photography.” Again, it depends on the kinds of photos you like to take, your personal preference and the market where you want to sell your image. The great advantage of Nikon cameras is that you can use older lenses on your body. This allows a lot more freedom of choice and means you can get really amazing older lenses at shockingly affordable prices. I’ll give you an example. One of my favorite lenses is a 300mm f4 manual focus prime lens from the 1970s. It cost only $350 CAD (meaning it would be much less expensive in American dollars) and the glass is still ED! Nikon especially developed ED (Extra-low Dispersion) glass to provide pricise optical colour correction. This special glass (not available in all Nikon lenses) provides the sharp, clear resolution required for superb photographs. The other advantage (at least for me since I generally hike to find wildlife) is that it weighs less and packs small. Another example — the 50mm 1.4 auto focus lens (that’s right f1.4!) sells for only $166 CAD (again, much less in American dollars). It’s actually an 80mm on your body. That means you have a prime lens at 80mm that can take pictures in the darkest settings. And, because Nikon has been perfecting its 50mm lenses since its inception as a company (Nikon used to include a 50mm on all its bodies until well into the late 1980s), it’s one of Nikon’s very best lenses. It’s cheap because 50mm on a 35mm camera is kind of pooey. But 80mm on a digial camera is marvelous. For wildlife photographers in particular, the one advantage of shooting with any Nikon digital camera these days is the magnification factor. Rather than create a sensor the same size as one frame of 35mm film, Nikon and most other digital SLR camera manufacturers decided to create a sensor that is smaller than the 24x36mm standard frame of the older film models. Having a smaller sensor means you aren’t going to capture all the information on the left and right and top and bottom of the frame. This may sound really bad… but there is no need to worry about what you haven’t captured because the viewfinder has been adjusted so that what you see optically is what is captured in the digital file. The result is that the camera multiplies the magnification of all the lenses. Nikon’s magnification (depending on the camera you use) is around 1.5x. That means a 300mm lens is now magnified to 450mm. This is great news for wildlife photographers. The only drawback is that wider angle lenses (like a 17mm wide angle becomes a 25.5mm not-as-wide-angle lens. However, landscape photographers still have some options. I’ll get to those in a bit. While I can’t tell you the right lenses to buy for your particualr needs… I can give you some feedback/impressions about the particular lenses I am using or have used in the past. Nikkor 18-70mm f/3.5-4.5G ED-IF AF-S DX Zoom – This lens is all right. I bought it as a kit lens a long time ago and it’s served well for the wider range. I wish I had saved pennies and purchased a 2.8 that offered a wider range (like a 12mm to 25mm). Tamron 17-35mm f2.8: This is a great lens but, alas, I purchased it for a film camera and the magnification on my digital body means that it isn’t that useful in my photography right now. I’m planning on selling it (along with my other wide angle) and buying a 2.8 that has a wider range so I can do more with landscape photography. Nikkor 50mm f/1.4D AF – This is the same lens I discussed earlier. It’s small, has a low price tag, allows you to shoot in really dark situations and it’s an 80mm on a digital camera. You really can’t go wrong. Nikkor Nikon 80-200mm f2.8D ED AF Zoom – This is a fantastic lens that stays at 2.8 no matter if you are shooting at 80 or 200mm. Again, magnification means it’s actually a 300mm zoom. Zooms are great because you can adjust your focus distance depending on where your subject is located. Not so great with subjects that are always far away (like the macaws seen here), but really awesome for docile wildlife like deer. It also has a macro function that works beautifully. Nikkor 105mm f/2.8D AF Micro, or 105 Micro for short – This is probably Nikon’s most used macro lens, probably because the lens can serve triple duty. First of all, it is a macro photography lens and it allows you to take photographs at a 1:1 reproduction ratio (on a 35mm body), which means that a 24 by 36 mm subject will fill the entire frame. Second, it makes a very good general purpose short telephoto lens. Third, it is also at least a very reasonable portrait lens (although, with magnification it may be too much of a telephoto on a digital SLR). I really love this lens for macro photography. Nikkor 300mm f4 manual focus – While a “prime” lens doesn’t offer the flexibilty of a zoom… it’s still an ideal choice for getting the best results in your work. This is the same lens I discussed earlier and, considering it cost only $350, it’s light & the focusing is so smooth, it’s one of my favorite lenses. I never leave home without it. Nikkor 600mm f5.6 manual focus ED Glass – Again, I paid a lot less for this lens (which is actually a hefty 900mm on a digital body and also has the famous Nikon ED glass!!) because it’s an older model and it’s manual focus. I spent $1,599 USD – but consider that a newer model would go for at least $5,000 to $25,000, depending on the f stop. Some may argue that 5.6 is a bit too narrow of an f stop but I find the compression with telephoto lenses means that I wouldn’t want to shoot a 900mm subject with anything wider than 5.6 (2.8 would make the focus far too shallow on such a far away subject). Although… for closer subjects 2.8 is magic! In the past, I have also used the Sigma 70-300mm 3.5-5.6 and the Tamron 200-400mm 3.5-5.6 and both served well as affordable zooms while I was learning about photography. I have since sold them to pay for the lenses I currently use. I used to be terrified of focusing manually. On most auto focus lenses, the focus ring is small and more difficult to use… also there’s something really easy about just allowing your camera to do the focusing work for you. I was afraid I couldn’t react quickly enough to moving subjects and that I wouldn’t be as good as my camera’s auto focus. Now I see the errors of my ways. For wildlife (or people), you want to make sure the main subject’s eyes are in perfect focus. You won’t be able to sell any image if the eyes aren’t in focus. If you shoot a subject 10 feet away at 2.8 and use auto focus, the camera will choose the object closer to the camera (usually the nose, cheek, or eye brow… not the eye itself). A 2.8 aperture means that you will have such a soft depth of field that the eyes will appear out of focus. The older (and more affordable) manual focus lenses have the most beautiful focusing rings you’ve ever seen. I find it much easier to use manual focus on my 300mm f4 lens from the 1970s than my newer autofocus 80-200mm zoom (using the auto focus feature). Unfortuately, I find the focusing ring on the newer models a little bit pooey… but I did want to make the case for why I think manual focus lenses from the 1970s are the greatest things since sliced bread! You may already be aware that your shutter speed should be at least the same as the distance of your lens. For instance, you need to shoot at least 1/300th of a second if you are using a 300mm lens or hand shake will make your picture look really blurry. And anything larger than 300mm should be put on a tripod (preferably one with a ball head for wildlife work). With magnification, you may be able to get away with shooting a 300mm (a 450mm on your digital) hand-held… at 1/450th of a second or higher…)in a pinch… but investing in a good ball head tripod will really improve your results if your lens is higher than 300mm.